Child & Youth Care Forum is a peer-reviewed multidisciplinary publication that welcomes submissions – original empirical research papers and theoretical reviews as well as invited commentaries – on the development, implementation, and dissemination of effective practices for children, youth, and families. Child & Youth Care Forum welcomes submissions from researchers, practitioners, and clinicians in child psychology, early childhood, education, medical anthropology, pediatrics, pediatric psychology, psychiatry, public policy, school/educational psychology, social work, and sociology as well as government agencies and corporate and nonprofit organisations. 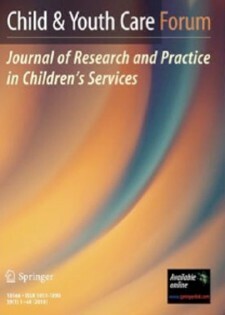 Child & Youth Care Forum has traditionally aimed to bridge the research-to-practice gap in children’s intervention and services and the current editorial board hopes to build and expand upon this mission by publishing scientifically excellent empirical papers and theoretical reviews that have implications for child and adolescent intervention and services broadly defined. In particular, papers that address the implications of typical and atypical development in effective interventions and youth care practices or that address assessment issues in child care and services are encouraged. Papers that address strategies for helping youth overcome difficulties (e.g., mental health problems) or overcome adversity (e.g., traumatic stress, community violence) are welcome as well as papers that attempt to help normal children actualize their potential (e.g., positive psychology goals). Methodological papers with implications for child and youth intervention and services are also welcome.